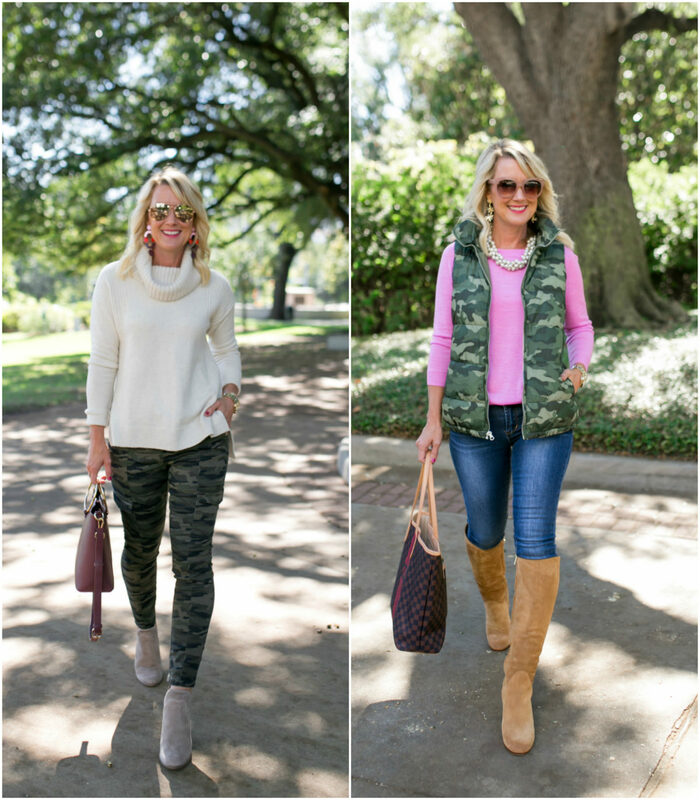 Camo | Two Ways | hi Sugarplum! Happy Halloween!! I hope everyone is prepped and excited for the evening ahead…whether that means schlepping behind your kids as they run ahead too many houses, or manning the relentless doorbell! I know I’ll miss these years, but I’m actually excited for the day when I get to stay home and see the parade of kids come by my house. Our weather forecast isn’t looking good, but we’re thinking warm, dry thoughts! Now, on to today’s style post…that I’m seriously so excited to share, as these outfits might be two of my favorites in quite awhile! 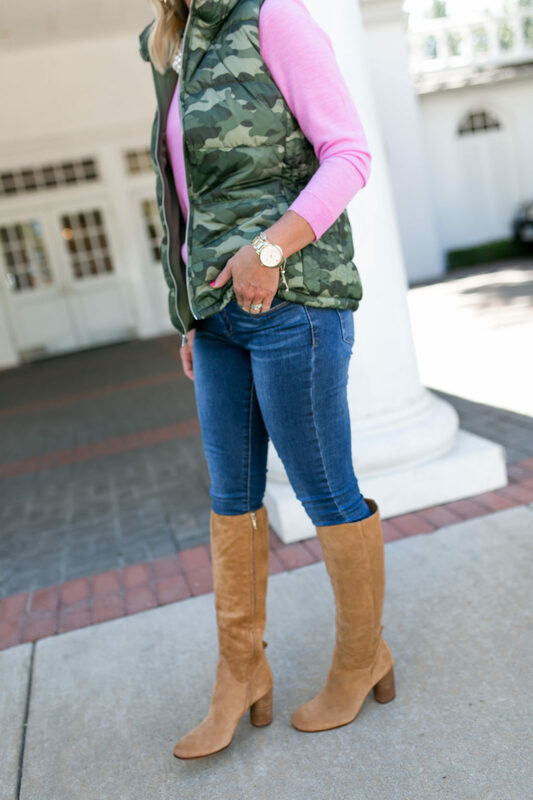 And while you might not consider yourself a camo girl, hopefully this post dispels any preconceived notions you may have about the pattern. 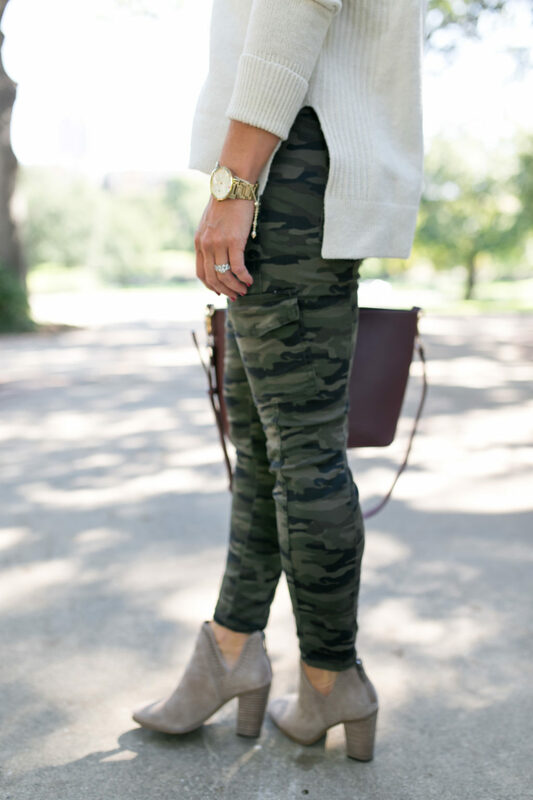 Because camo is everywhere this season, friends! 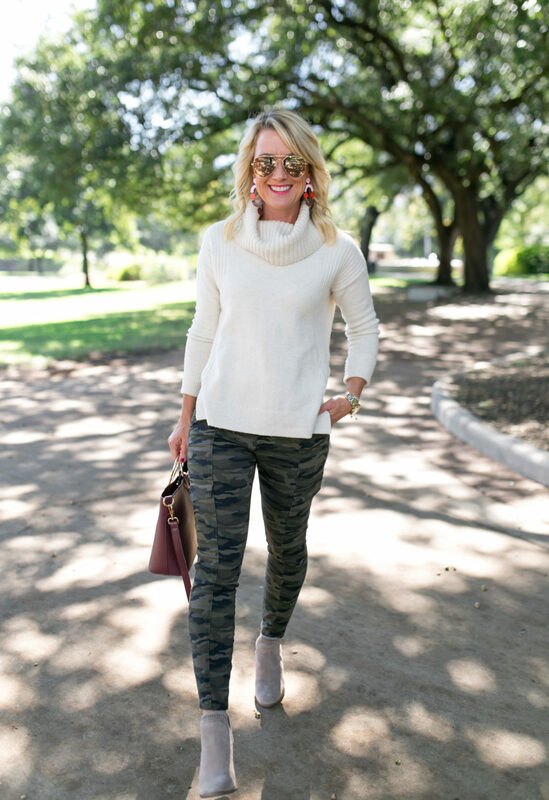 If you’re just easing it into your wardrobe, look for a subtle print with muted tones like these cargo pants, and pair them with any colors you would olive. 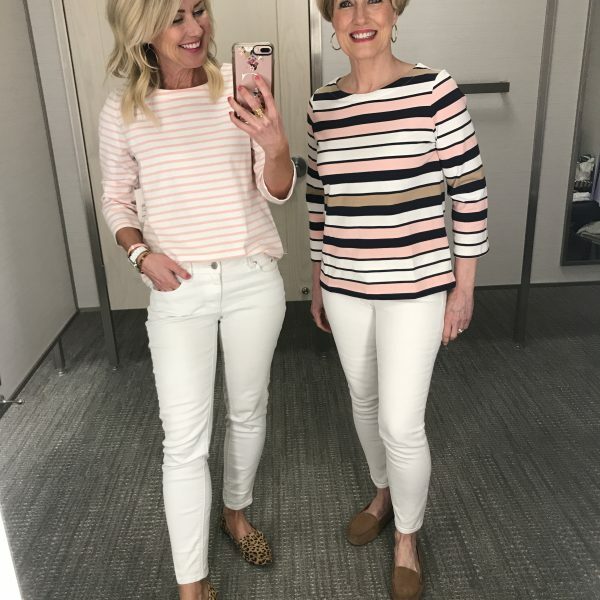 Fit Tip: These pants are buttery soft and stretchy…and while they are true to size, I opted for petite for a cropped length. I’m wearing a 26P. 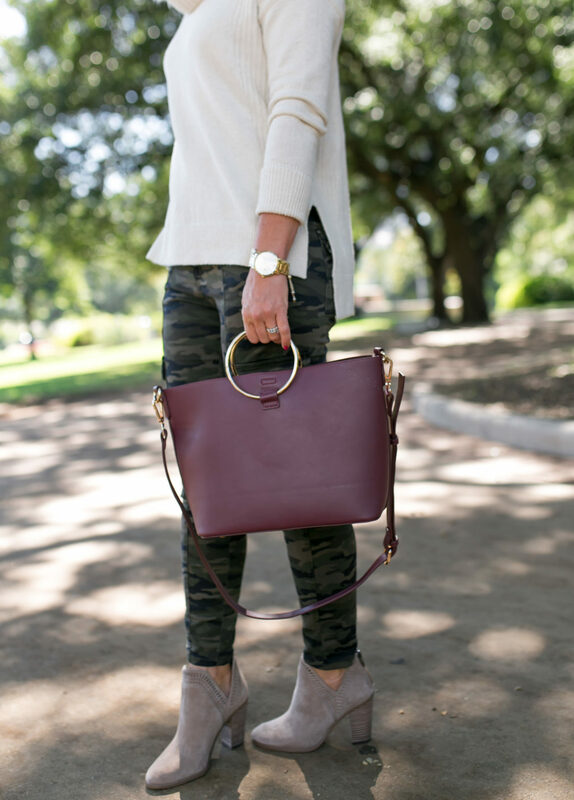 The soft ivory and camo is so pretty with gold accessories, but I opted for a little hit of color to liven it up. 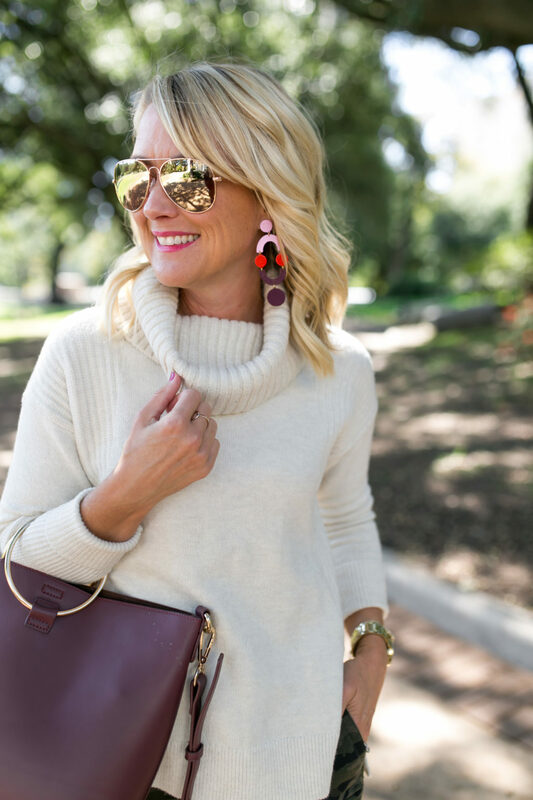 These earrings are so light, and add my favorite color combo (blush and burgundy!) to my outfits. I shared this turtleneck with you in the last Dressing Room Diaries, and I can’t endorse it enough! 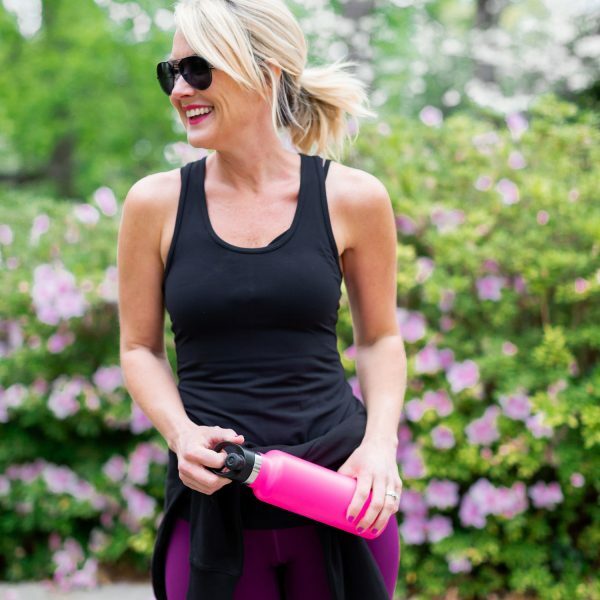 It’s super soft and stretchy, with a comfortable, relaxed fit through the neck and body. It’s soft enough to wear alone, and thick enough to layer over another shirt (no sheerness). The sleeves are nice and long, but I just cuff them. Fit Tip: I’m wearing a regular XS. Think the camo print is too masculine for you? Well, pair it with pink and think again! I even added pearls for a little more feminine style, and to dress the whole thing up a bit. I nabbed these boots at the Anniversary Sale, and am surprised by the versatility of the buttery honey color (just like this moto jacket!). 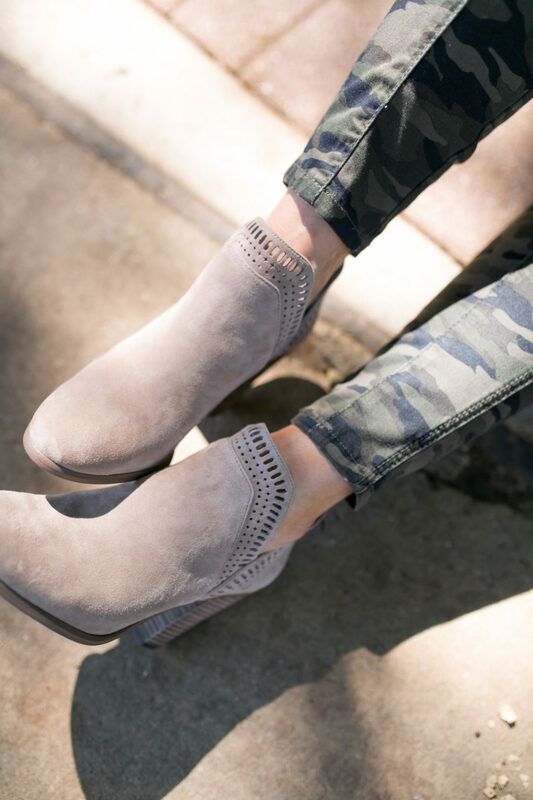 The heel makes them a little dressy and adds a lot of style to even the most causal outfit. 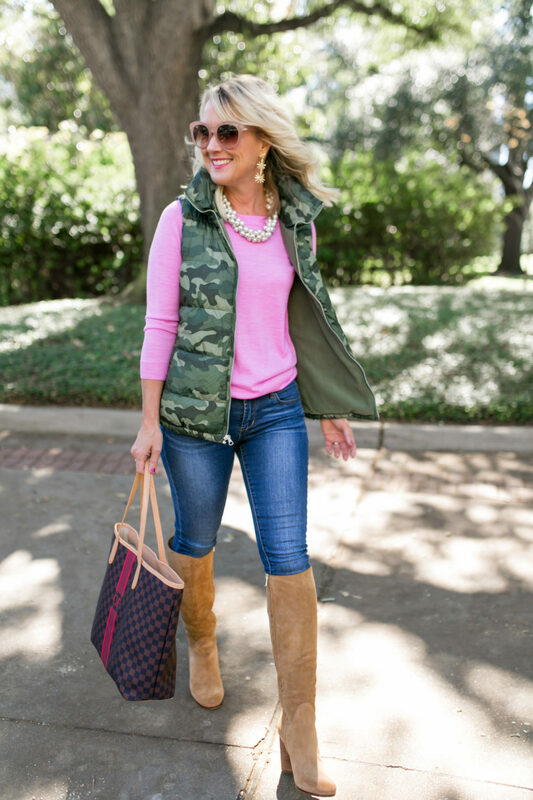 Vests are great for our milder climate…they allow me to add a layer for style, without a lot of bulk. Or overheating! So where do you stand with camo? Are you already a fan, or have I managed to convince you to be one now?! 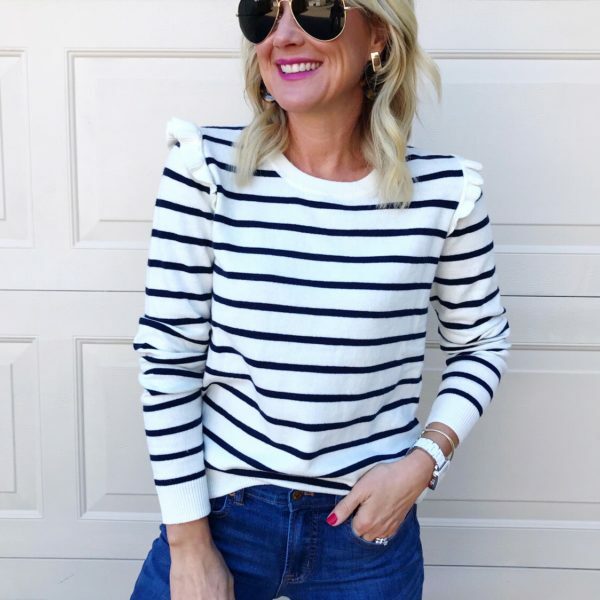 It’s much easier to style than you’d think, and is incredibly versatile in your closet. In fact, I could have done an entire Five Ways around the pattern! 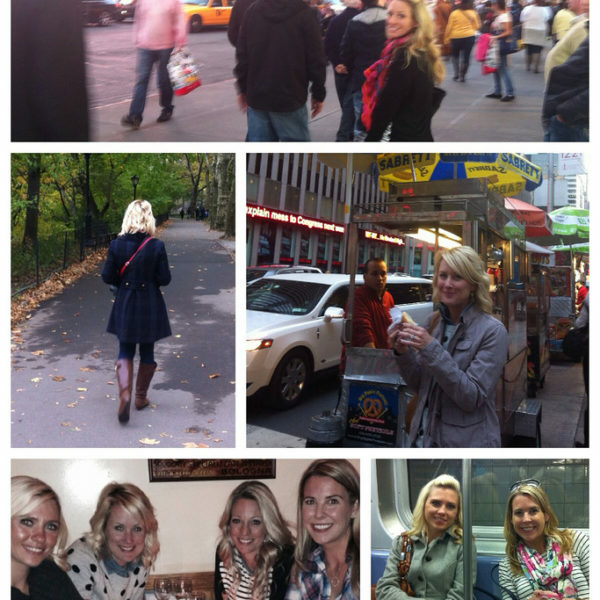 Well, considering the Peplum & Camo Jacket post from last month, I’m halfway there! Find more Fall Styles here. 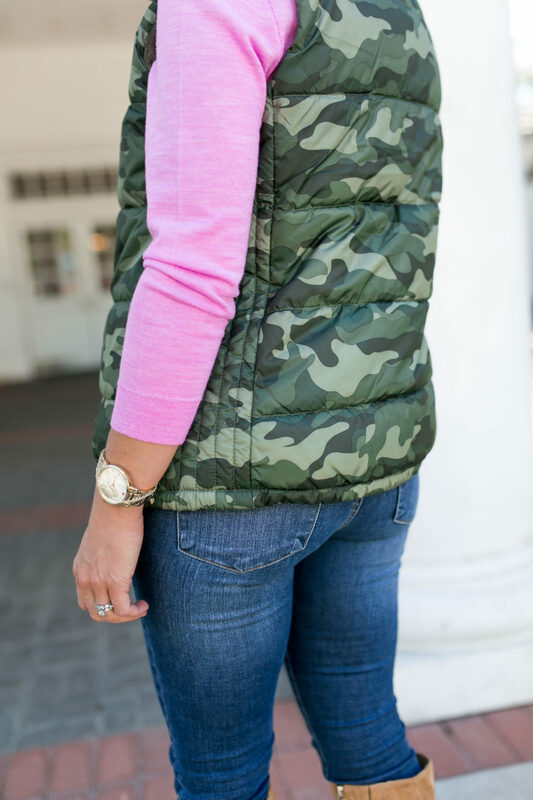 Oh, that camo vest w/pink merino wool, w/denim=perfect. Great prices too! Thx for sharing your great fashion sense! 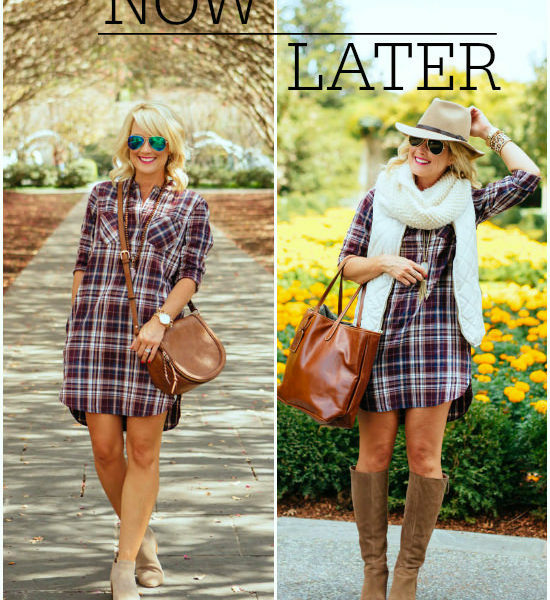 Love your style and your help pulling together outfits. I need it! 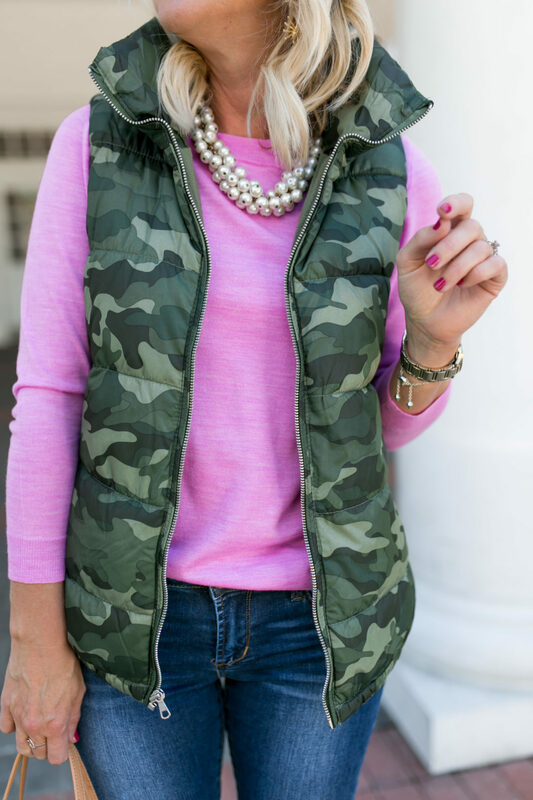 The pink with the camo is fabulous!!! If you ever spot any blue or grey based camo, let us know; the olive green tone is not my friend!! Camo cutie for sure! 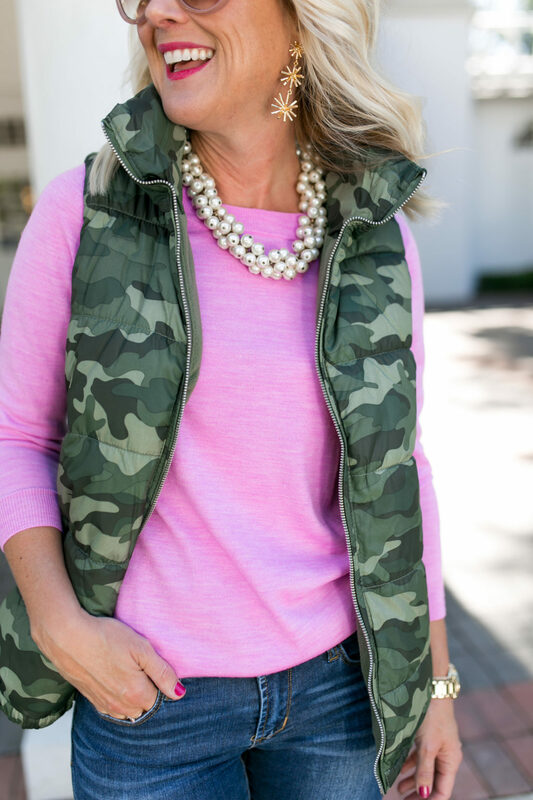 Loving the addition of the pearls and I’m still kicking myself for not jumping on those camo pants when they still had my size. 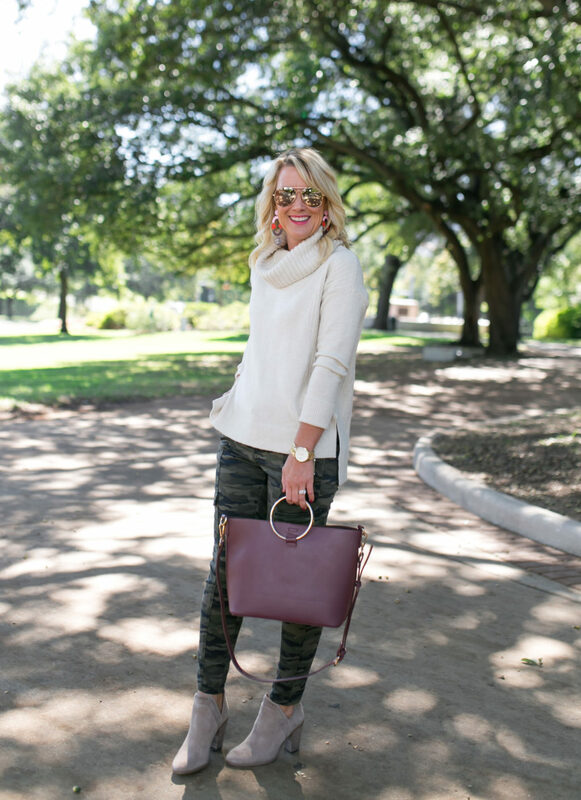 I have them in the olive and they are so comfy and flattering! Of course you NEVER look anything but cute honestly but – I’m still a “no” vote for camo. It looks like it’s trying to hard or something LOL, not my fav. 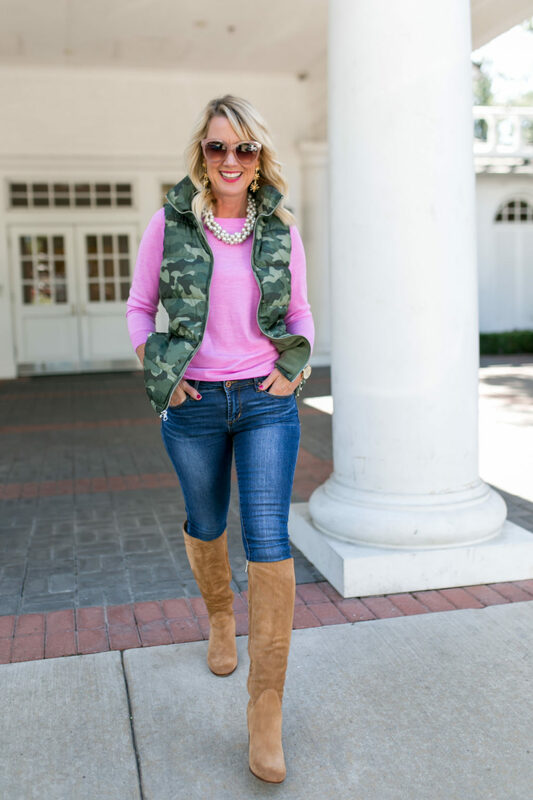 I LOVE my camo jeans and my camo vest!!! I ordered the vest after one of your posts a while back … it’s been a great purchase. So cute! I love both looks! 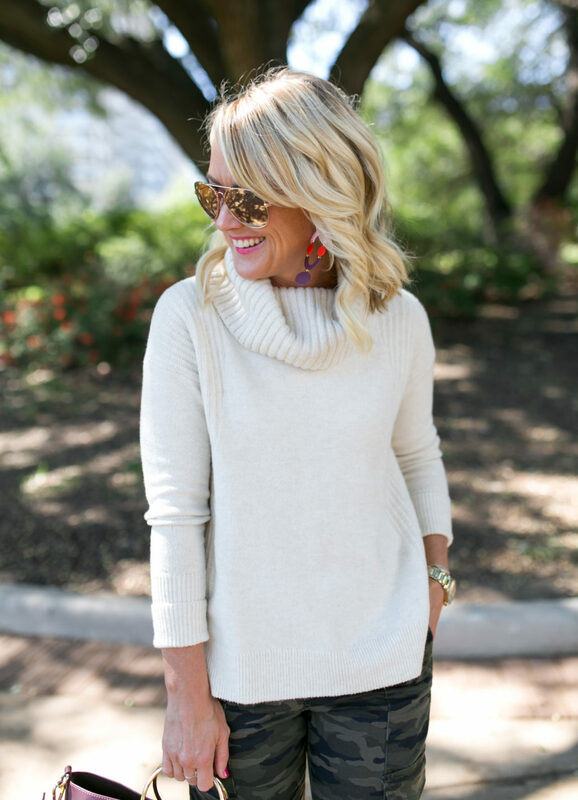 The puffer vest might be my favorite, although that creme sweater looks so cozy too! 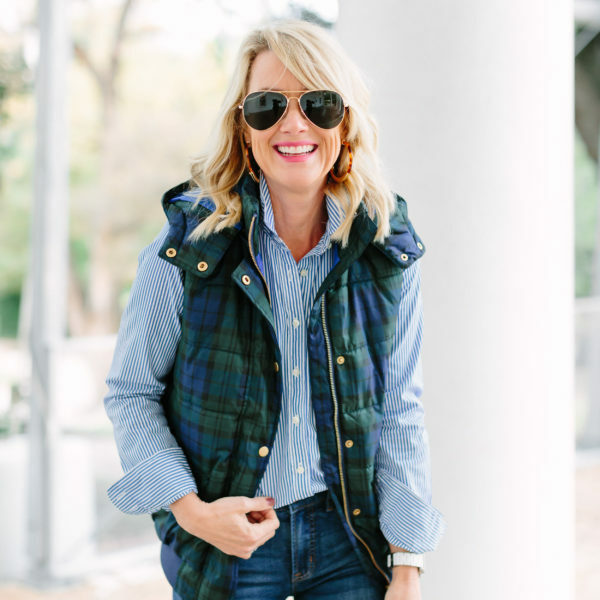 I bought the puffer vest after seeing it on your Instagram account….and I love it!! I would never have paired it with pink. I’d love to see how else you would style it. I love that it is budget friendly and comes in tall. I love the camo! You have a great way of pulling unusual pieces together. Between you and honey we’re home I am always looking stylish. Thank you ! Okay, this is the best post I’ve seen on styling camo!! I love how you styled it and all the girlie accessories! This is hands down my favorite! Any other suggestions for a similar pink sweater … looks like they have coral but not the lovely pink. 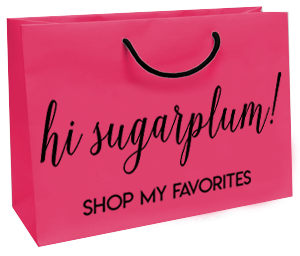 Thank you … love the post! Thanks so much, Kate!! My stripe is the crimson and oxblood!